To create a desktop shortcut for Excel, Outlook or Word 2013 on Windows 8.1 or Windows-10, please open the old start menu Folder! Please start the MS-Explorer for Example via keyboard shortcut [Windows-Logo+E]! Enter in the Adress Bar the Folder-Path shell:Common Programs\Microsoft Office 2013 and confirm with [ENTER]! Now you will see all OFFICE 2013 Program-Shortcuts! Drag via Right Mouse or Copy and Paste the required Office-Tools to the Windows 8.1 Desktop! (Image-1) Excel, Outlook, Word 2013 Desktop shortcut! Windows-8 - FAQ-203: Desktop shortcut for Excel, Outlook, Word 2013 / 365 on the Windows 8.1 / 10 Desktop? Creating outlook 2013 shortcut on the desktop? Excel shortcuts on desktop not working in windows 8.1? Cut icon for word on windows 8.1? Windows 8 launch excel 2013? How to put office icon on desktop? How to get word and excel to destop shortcut on windows 8.1? How to add office icons to desktop automaticlly? How to add 2013 icon to my desk top? Office 2013 icons are blank windows 7? Excel short cuts on window7 ultimate? What are the starting word from the icon on windows desktop find out how? Create desktop shortcut for excel 2013? Add icon to home page for outlook in windows 8.1? Start word from shortcut, create word shortcut to desktop windows 8.1? How do i create a desktop shortcut for word 2013? 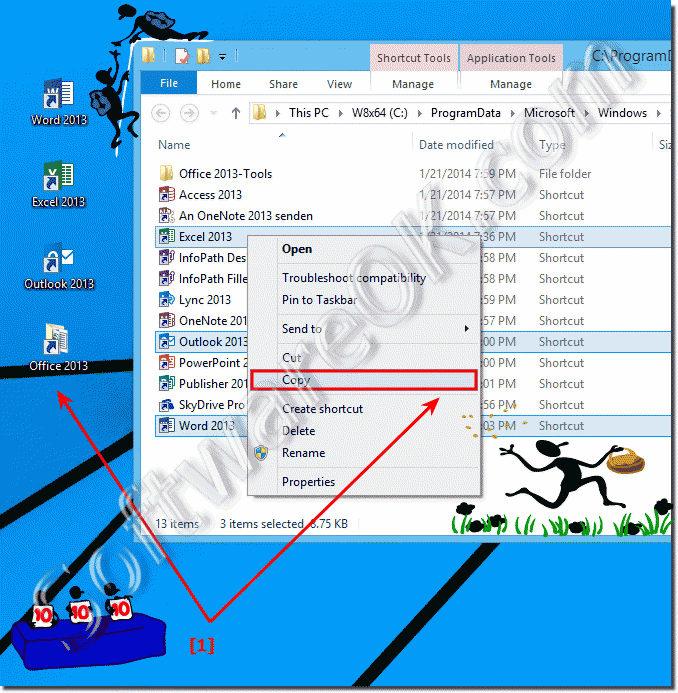 How to create shortcuts for office 2013 in windows 8? 8.1 create short to excel 2013? Add Excel to desktop windows 7? Shortcut for opening ms word in windows 8? How to install excel in word on desktop? Problemen snelkoppeling word windows 8.1? Putting office shortcuts from win 8.1 start to desktop? How to create desktop shortcuts of office in windows 8? How do i show one drive icons from outlook on my desktop eindows 8.1? How to add word icon to all users desktop in windows 10? Create shortcut windows 10 excel? Where is microsoft office icon on windows 8.1? Windows 10 snelkoppeling naar outlook? When i upgraded to windows 8 i lost excel and word? How do i create a shortcut for microsoft word on win 7? How do I add an excel icon to my desktop? Create win 8 shortcut for excel? How do i set a desk top shortcut in office 2013? Word 2013 shortcut for desktop? Add desktop shortcut to word via group policy windows 2012? Word for windows 2013 icons? Move excel page to desktop? How to make excel shortcut windows 8 pc? Microsoft office application icons missing windows 8.1? Outlook shortcut on desktop windows 8? How do i get microsoft word icon on my desktop? Desktop excel and outlook work on windows 2013? How i am open microsoft office in window 8.1? Launch word 2013 in windows 8.1? Office 2013 shortcut requires start in? How do i create a shortcut on my desktop for excel spreadsheet? How to make an excel 2013 icon for desktop? How to change the desktop icon for microsoft word 2013? Icon auf desktop bringen von Word unter Windows 10? To create a desktop shortcut for Excel, Outlook or Word 2013 on Windows 7? Microsoft office 2013 shortcut bar windows 7? Excel shortcut desktop windows 8.1? Where is word excel in window 8.1? WINDOWS 8.1 ADD ICONS TO DESKTOP FOR EXCEL? Where is my word 2013 icon on my desktop? How to create a desktop shortcut for outlook 2013? How do you open excel on windows 10? HOW TO CREATE A DESKTOP SHORTCUT FOR EXCEL SPREADSHEET? Create desktop icons for windows home and student 2013? How to copy and paste excel into desktop for windows 8? Create a shortcut for excel office 2013? Windows 8.1pro Microsoft word and excel download? Word von win 8 auf den Destop? Word 2013 shortcut on desktop windows 8.1 via group policy? Windows 8.1 desktop shortcut to outlook? How to create shortcut desktop word 2013 in window 7? Windows 8 outlook shortcut to desktop? How to create shortcuts for office 2013 in windows 7? Can i access outlook.com from my desktop in win. 8.1? Create outlook shortcut on desktop windows 8? Excel shortcuts for windows 8? How to move a document to desktop in excel 2013 windows 7? Windows 8.1 to create shortcut of office 2013 on desktop? Put office 2013 excel on task bar? How to create office shortcuts on windows 8 desktop? Create desktop shortcut for office 2013 in windows 8? Open excel with shortcut windows 7? Outlook 2013 create desktop shortcut? Word 2013 is missing in win 8.1? Create a desktop shortcut to outlook on windows 8.1? Office 2013 windows 8 start icons? Create group policy for microsoft office desktop shortcuts? Outlook icon blank windows 8.1? How to place word icon on desktop? How du i find excel on windows 8 desktop? How to create office 2013 shortcut in windows 10? How to create a shortcut icon for Microsoft excel? Windows 8 add shortcut to word 2013 on desktop? How to find word and excel on windows 8.1, Put excel on desktop windows 8? Windows 8.1 outlook shortcut desktop? Shortcuts for outlook 2013 in windows 8.1? How to put ms office icon on w8 desktop? How to create a microsoft office 2013 shortcut on windows 7? Create Outlook 2013 add shortcut on desktop windows 8? Shortcuts microsoft office 2013 desktop? Excel shortcut desktop 8.1 by policy server 2012, shortcut excel in windows 8.1? Shortcut for active excel to desktop? Set up shortcut to a folder on my desk top 2013? Office 2013 create desktop shortcut windows 8.1? How do i activate word 2013 on the desktop?